When I was a little girl, my younger brother and I were convinced if we strapped enough household wires to each other and fell asleep in the same bed, we could meet each other in our dreams. Of course, my mom told us it was impossible, but that didn't stop us from trying. 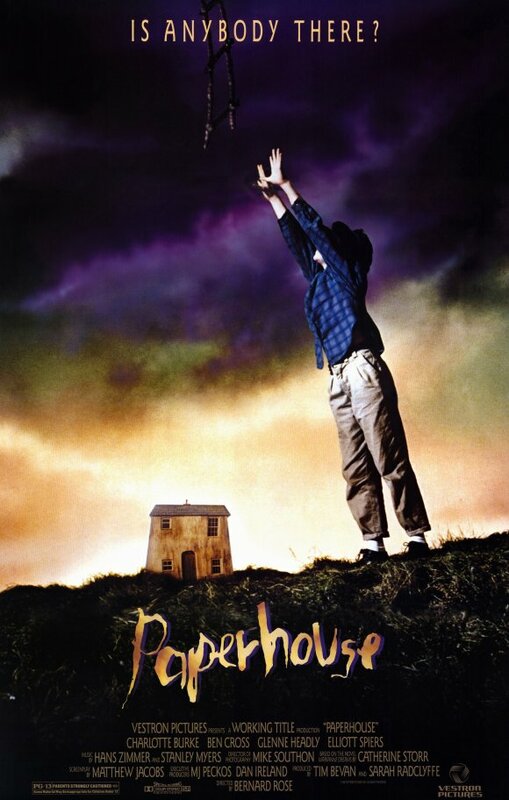 Children with my wild imagination and faith in the impossible would love the concept of "Paperhouse." Of course, "Paperhouse" has a very adult angle that makes it, ultimately, best for grown-ups. 11-year-old Anna (Charlotte Burke,) who is at that age where kids mouth off to their elders and will pick a fight over absolutely anything, faints in school on her birthday and is discovered to have a raging fever. 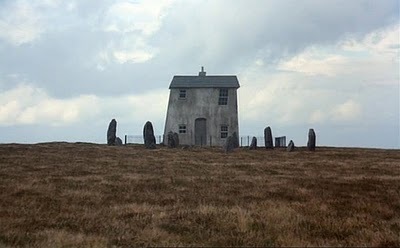 Bizarrely, when Anna faints, she discovers that when she's unconscious or asleep, she enters a world entirely unlike her own- to be precise, to a remote house she has drawn before her dizzy spells began. In the house she meets a boy, physically handicapped Marc (Elliot Speirs, who died at a tragically young age,) who bears startling similarities to a boy with muscular dystrophy who Anna's doctor (Gemma Jones) is seeing, and who Anna has never met outside to dream world. Anna's unspoken issues with her well-meaning but hard-drinking father (Ben Cross) show up too when a fictional recreation of dad shows up at Anna and Marc's secret hideaway, raging, evil, and wielding a hammer. Caught between wakefulness and forever sleep by her life-threatening fever, Anna must fight for her sanity and her life, as well as the life of her newfound friend. Contrary to certain opinions, I found the acting in this to be quite effective, from most of the child players as well as the adults. The kids aren't always the best, but what do you expect with newbies to the craft? Despite her brattiness, I didn't find Anna to be an unlikable character- actually, I saw her as a bright and willful child struggling to cope with a childhood harder than most. The psychological angle here is really fascinating- Anna's mostly loving if distant father becomes a malformed monster in her dreams, while her mother (Glenne Headly) fails or refuses to see her husband's alcoholism and the rift between him and their daughter. It resounded with me for entirely personal reasons, and I loved the entertaining yet insightful script. The set pieces here are also magnificent, and this movie has one of the scariest and most memorable dream sequences I've ever seen, the kind of thing that haunts the nightmares of any children unfortunate enough to watch it. The score, however, is mediocre- mostly typical 80's movie music. 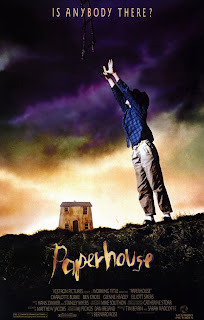 "Paperhouse" is an entertaining and underrated gem of the 80's, and although it's not full blood horror, it has enough unnerving moments to make it 'light horror' for people who don't like really intense scary movies. Although it's not available as yet on Netflix, it's totally worth getting online if you have a DVD player that will play it. This is a great film about childhood dreams or fears around the lines of "Pan's Labyrinth" or "Coraline," and definitely worth checking out. Wonderful review! This sounds like something I'd like. Loved the intro too. Cute story.